Please feel free to email me with any questions, comments, or requests. I love a challenge and welcome all your feedback! What's Cooking At Billa Cakes? Billa Cakes is the brain child of one hot mama: Me! It's named for my daughter Sybilla, who is my inspiration and motivation. I love baking and as an artist, it gives me an outlet for my creativity as well as an opportunity to help create memories for a lifetime. Currently this is a hobby to gain experience, but someday I plan on making it into a full time gig! My training includes some classes from my local baking supply shops, the Food Network and the internet. I am a full time student in the School of Hard Knocks. My hope with this site is to showcase my work as I develop my business and to share my learning experiences with others so they can learn too. Thanks for following along! This past weekend I had the pleasure of creating a cake for a bird themed baby shower. My friend Anna had sent me a picture of a similar styled cake and asked for strawberry cake with cream cheese frosting with the same design. Having returned from picking almost six pounds of fresh strawberries the weekend before, it felt like serendipity. The design was fairly simple and easy to recreate; the difficulty was getting the frosting to be smooth all the way around and on top! I think I did a pretty good job of getting that accomplished. The best was also a little bit tricky since I remembered it at the very last minute. 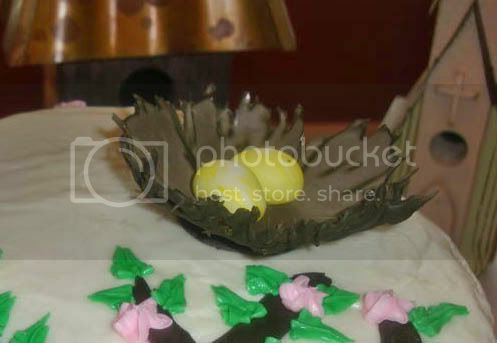 All week, I had been doing things and gathering stuff to prepare for the cake, and I totally forgot to think about the logistics of the nest. Michael said I should just make another batch of chow mein marshmallow nests, but I didn't have any more chow mein noodles and it was already pretty later. 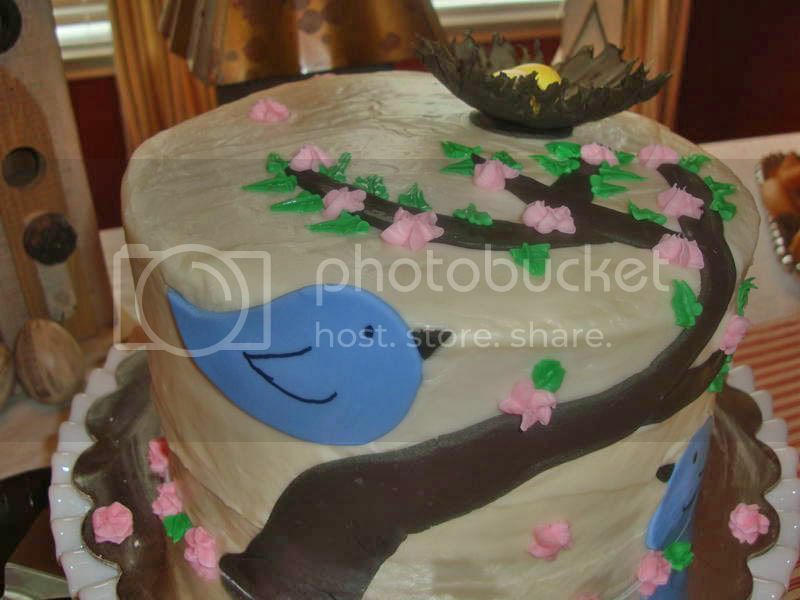 Besides, I wasn't too sure how it would look on the cake. I had some royal icing that I was using for the flowers and the leaves (because temperatures in Texas have begun to heat up and I didn't want them to melt if I used cream cheese frosting), so I tookt he leftovers, mixed them together, added some black and brown, then draped a plastic baggie over something concave (a candy dish in this instance) and started going to town trying to create a nest like texture. It came out beautifully! The eggs are fondant. All in all, Anna said the cake was a hit and that the lucky mom to be was able to take home the leftovers to share with visiting family. 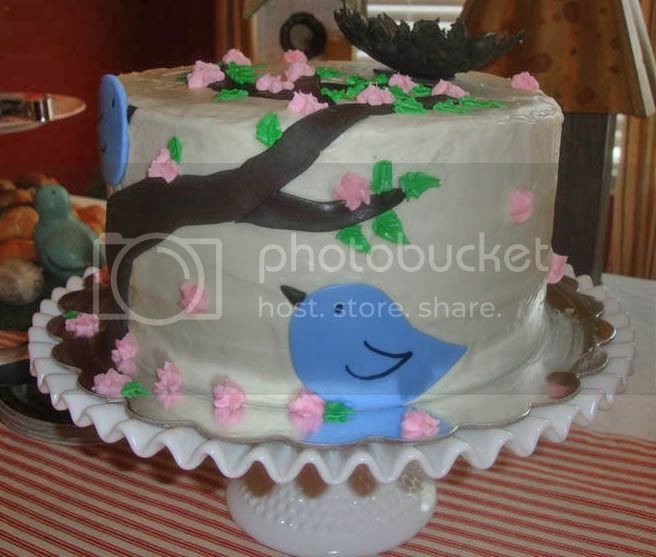 I hope this inspires you to make you your own birdie themed cake!